Symphonies: No. 6a (1964) [29�14]; No. 9b (1974) [19�31]. The Country Beyond the Starsc (1958) [30�48]. 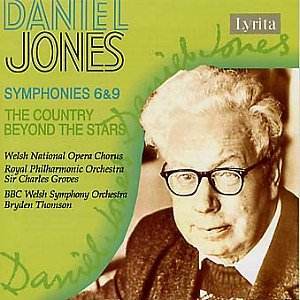 Daniel Jones� music does not deserve its neglect, and this disc shows why. Jones wrote thirteen symphonies in all. Lyn Davies� excellent booklet notes tell us that the Symphonies Nos. 6-8 (1964-1972) �see a greater emphasis on clarity and conciseness and move away from a more romantic outlook towards classical outlines�. It is certainly true that Jones was a master orchestrator (textures seem continually clear, with little or no obfuscation of lines). The dark, craggy and disjunct opening of the Sixth Symphony of 1964 immediately sets out the terrain. This is a dramatic gesture (almost but not quite filmic) designed to prepare the listener for an emotional work-out. Jones� use of harmony is interesting in that for contrast he can call upon constructs that can best be described as �sugary�. He is unafraid of any resultant perceived anomalies, as his compositional technique is more than enough to encompass extremes. The metrical games (juxtapositions) of the Agitato second movement (of six, grouped into pairs) are underpinned with an intense seriousness of intent. If the harmonic language of the Sostenuto (third movement; beginning of the second �part�) seems at first a trifle anonymous, the long, achingly lyrical lines that Jones calls on later are most affecting (especially in as concentrated a performance as this one, with the RPO�s strings outdoing themselves). The ensuing Con brio section is also performed magnificently. Unfortunately the last part seems to have a slight tendency to meander, rendering it something of an anticlimax. Nevertheless this piece demands to be heard. The Ninth Symphony was commissioned by the Llandaff Festival and is dedicated to the composer�s wife, Irene. It is around ten minutes shorter than the Sixth and seems, as if to reflect this, even more terse (in its outer movements, at least). The first movement immediately gives off an almost tangible sense of the larger structure (having Bryden Thomson at the helm must surely help here); the argument is gritty. Much of the surface shifts restlessly. Pungent harmonies make the Lento a memorable experience (and for a measure of how involved the payers are, listen to how the violins attack their entrance at 2�21). Although only six and a half minutes long, this movement actually constitutes quite an epic journey. The mobile accents of the Allegro scherzando are much more of the dance variety that the music has hitherto allowed; alas, the finale is perhaps surprisingly brief. A choral Cantata rounds off this release. The Country Beyond the Stars sets a text by Henry Vaughan (1622-1695). There are some lovely moments in a work that exhales the air of the Valleys. It is appropriate perhaps that the chorus should be that of Welsh National Opera. The chorus sings with the utmost dedication. This is a heart-warming work and the orchestra plays marvellously (it even has a movement to itself � the third, entitled, �Morning Visitors�). The fourth movement, �The Morning Watch�, somehow gives the impression it is to close the Cantata, but a full two movements are left. �The Evening Watch�, is a gentle crepuscular evocation of sleep and death. Few movements are more aptly titled than the final �Cheerfulness�, with its ever-so-jaunty theme that is subjected to seemingly endless imitation. A more spiritual aspiration kicks in at the line, �O that I were all soul!�. Simon Gibson�s remastering of the various Pye, HMV and BBC sources is superb. He admits to a technical fault on the master tape of Symphony No. 6, but it will not detract from anyone�s appreciation of this obviously important composer. I have no doubt that there are those who will find this disc (or at the very least parts of it) nothing short of revelatory.